This is a lite version of the Interval Wizard app also available. 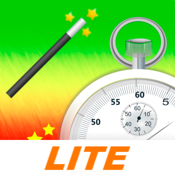 Using this lite version will allow for a taste of Interval Wizard app. The full version of Interval Wizard is a simple straight forward wizard driven app that allows for super easy setup for virtually any type of workout sessions requiring 2 or 3 interval timers. The user friendly interface will guide you step by step through setting up your timers so that you can start your workouts quickly without getting bogged down with complicated menus and settings. - Easy to use wizard style interface with textual guides and spin wheels.